This fuchi kashira has been attributed to Kyo Kinko by the NBTHK. Mumei. Mid to late Edo period (18th-19th century). 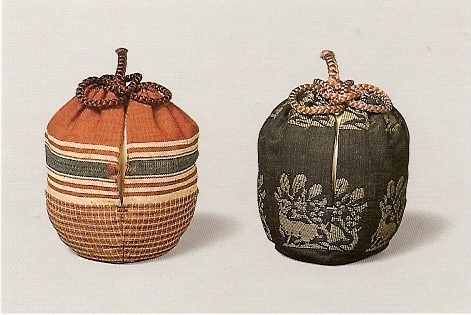 On the shakudo nanako plate shishi dogs playing with the cords of a shifuku (decorative bags for tea caddy) are engraved with gold colour. Kyo-Kinko refers to soft metal workers from Kyoto who were active during the Edo period. Although there are some exceptions the quality of their work is usually below that of the Goto or Waki-Goto schools. In saying that the quality and condition of this fuchi kashira is excellent. It is my opinion that a Kyo-Kinko attribution is sometimes a bit of a cop out for the NBTHK and NTHK. It offers them the opportunity to apply a generic or ‘catch all’ attribution when they aren’t sure of the Real school or artist. 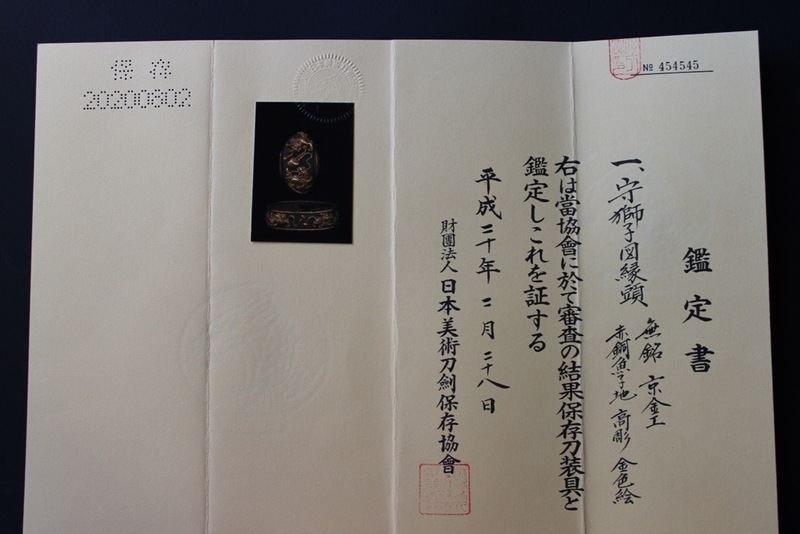 This is similar to the Hosokawa Masachika attribution of many mumei shinshinto swords. It is a risk free option for organisations trying to please customers who are forking out good money for an informed opinion on their pride and joy. I am no expert however and perhaps the NBTHK are spot on with this. It must be very difficult if not impossible to appraise some items. Shishi (or Jishi) is translated as “lion” but it can also refer to a deer or dog with magical powers to repel evil spirits. A pair of shishi traditionally stand guard outside the gates of Japanese Shinto shrines and Buddhist temples. As guardians outside the shrine gate, one Shishi is depicted with its mouth open (to scare off demons) and the other with its mouth closed (to shelter and keep in the good spirits). Another traditional explanation for the open/closed mouth relates to Ah and Un (“Ah” is the first letter in the Japanese alphabet and “Un” is the last). The combination is said to symbolically represent birth and death. This mythical and magical beast was probably introduced to Japan from China via Korea in the 6th or 7th century AD, during the same period as Buddhism’s tranmission to Japan, for the Japanese Shishi combines elements of both the Korean “Koma-inu” (Korean dog) and Chinese “Kara-shishi” (Chinese lion). It appears that the shishi are playing with a shifuku (decorative drawstring bag) containing a cha-ire (tea caddy) It appears they have undone the elaborate ropes at the top and are playing with them. I am not sure of the significance of this. Perhaps the owner was a fan of the tea ceremony (like many samurai).